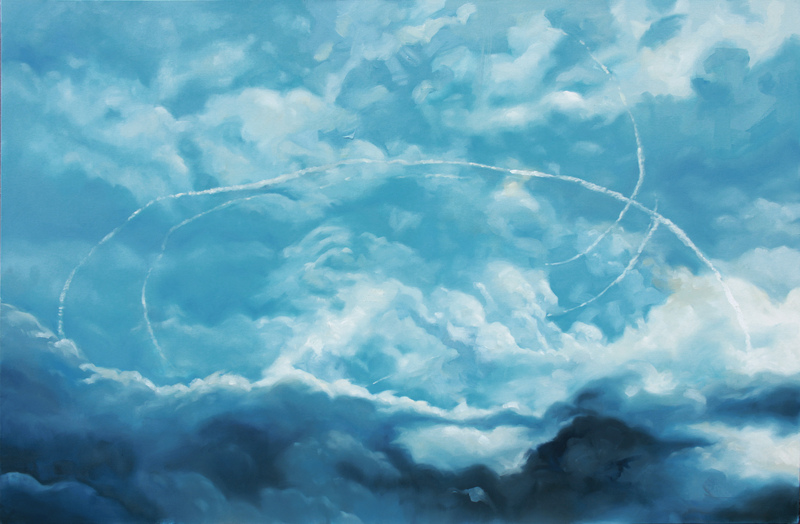 Scott Waters: Contrails, 48″x72″, oil on canvas, 2012. Throughout 2011 Scott Waters followed The Third Battalion of the Princess Patricia’s Canadian Light Infantry as they trained for and were deployed to Kabul, Afghanistan, for the start of Canada’s post-combat training mission in that country. ROTOZERO is a project created through the auspices of The Canadian Forces Artist Program, but whose central characteristic is one of contemplation. ROTOZERO is less a document of a mission and more a consideration of how we recall and construct stories. Incorporating painting, photography, text panels, and found objects, it is an assemblage of tangible objects which act as proxy for the narrative drive a narrative drive which, in this case, is based on the anticipation, boredom, frustration, terror, and sense of expectation that are markers of the training mission to Afghanistan. Read DAVID BALZERS Circles and Zeroes, an essay about SCOTT WATERS exhibition.